In November 2016 Midlands Golfer released our biggest ever travel supplement, a feature that had been eight months in the making. If you’re talking about a labour of love it can’t get a lot better than a MG Scotland guide. The amount of times we heard the expression ‘It’s a tough job but someone has to do it’ on our travels almost exceeded the number of warm welcomes we received, almost. But what we achieved from a trip to the SSE Hydro in Glasgow and The Scottish Golf Show in mid March, right through to going to print day on Thurs Nov 17th was also something way beyond our expectations. So now the magazine is out, it’s time to put all of this online as a thanks to all who supported the supplement and helped to put it together. Throughout this online feature you can read in detail about all of the clubs and hotels who were kind enough to support us. But this part is a little different, it’s all about us, dedicated to the times we enjoyed in Scotland in 2016. The clubs, courses, hotels we played and stayed at along the way. The folks we met, the stunning surroundings, the laughs, the anecdotes and all of our personal highlights. It’s a long page, we’ll warn you of that right now, but we wanted to pay tribute in our way to The Home of Golf, have a little mickey take where necessary and describe just why we found it all so fantastic, and why you should visit too and make your own memories. After all, Golf is fun. As long as you love the game, it’s impossible to not love golf in ‘The Home of Golf’, my own personal journey began with regular trips north in the 1990’s to see Dad and family. He lived for a number of years on the Isle of Mull, a magnificent place full of mountains, lochs, wildlife and more importantly two amazing and hugely contrasting nine hole courses, Craignure and Tobermory. The memories made there never left me, so once I made it into golfing media, Scotland was always top of the wish list for areas to cover with a feature supplement. 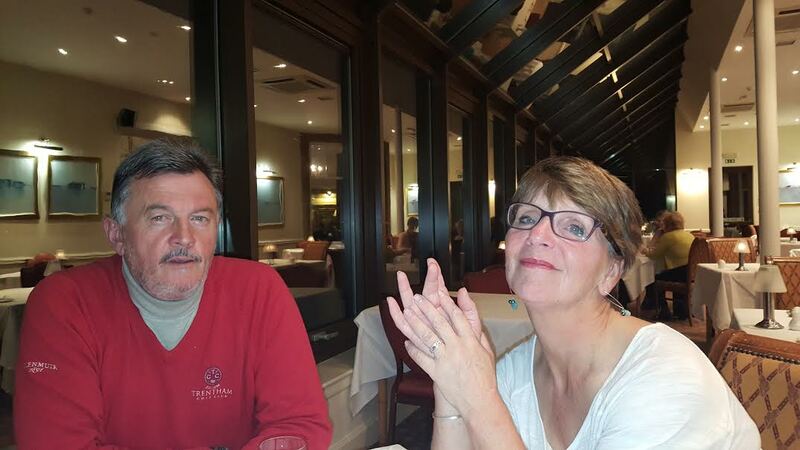 I just needed a couple of like-minded golf nuts who were prepared to put in what was needed to produce something special, enter Mandy and Jean-Louis Ambert. The three of us bore the brunt of the work and the visiting, but we also roped in Andy, Spencer and Carol who all enjoyed a trip as well. Tebay Services here, a family owned service station close to Junction 41 near Penrith on the M6 became a bit of a mascot for the trips. Their magnificent breakfasts might have had something to do with that! Every trip we made to Scotland this year had a bit of Tebay attached to it, we ate on the way up, and shopped on the way back down, home produced and local food and drink to take back to the families. Following months of calls and emails we finally made it to Scotland and set about the task. Andy and I only had one game on the agenda but I confidently predicted more would follow, they had to, Andy is a serious golfing nut! It was a murky and drizzly beginning, wasn’t really golfing weather but the meetings went well. 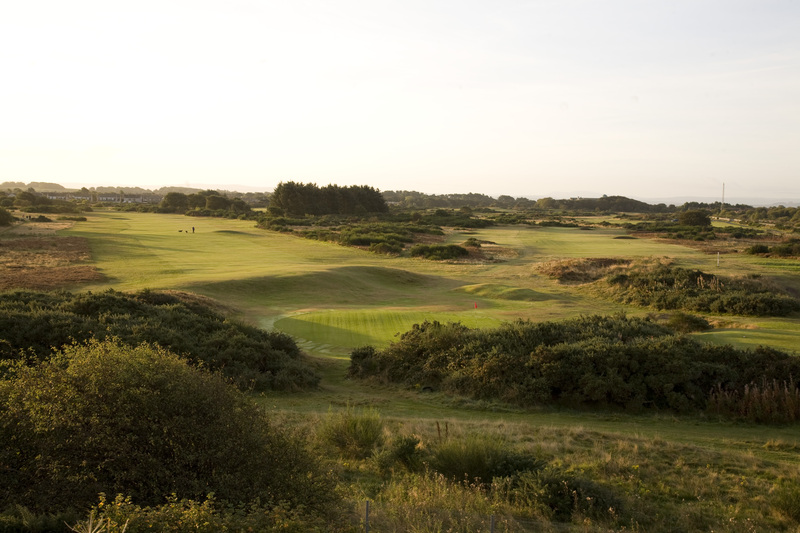 Ayrshire is an area absolutely packed with golf, once you reach the coast, courses more or less back into each other. 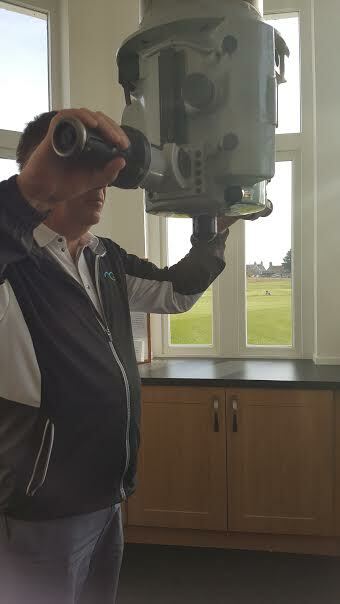 We held some meetings and toured a few venues, even having a sneaky tour around Royal Troon, not many golfers there, plenty of workmen, it was just three weeks before The Open started. But when driving away mid afternoon the weather was on the mend, and golf starved Andy was ready for some. So we drove into the car park owned by Kilmarnock Barassie Golf Club and spoke to Gregor in the pro shop. He set the standard for what we were to be treated to during the whole thing, Gregor’s warm welcome extended to nine, now very sunny late afternoon holes on The Hillhouse Course (below), one of three loops of nine at Barassie. We had a great time and a fun nine where we actually played rather well, Andy fell in love with golf in Scotland at first sight. Day two we did have a round booked following a couple of early meetings, this time at Barassie’s near neighbour, The Irvine Golf Club. What a great treat it was too, proper rough and ready links golf, humps and bumps and wild grasses, fierce pot bunkers and speedy greens, basically just what we came for! On the Wednesday we travelled further north into North Ayrshire and beyond to Greenock and the edge of Glasgow, we met club chairman Jim at Greenock GC, he was only too happy to give us a guided tour, you get some views up here, let us tell you. Later on though back down Troon way. 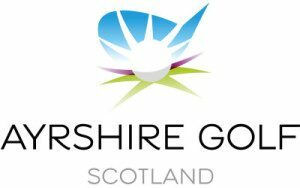 We’d held a meeting the day before with South Ayrshire Council’s Keiran, they run 8 courses surrounding the Championship links venues of Ayrshire. He offered us a round of golf on one of them, Andy, who had always wanted to play golf in Troon was more than enthusiastic to take him up on his offer. 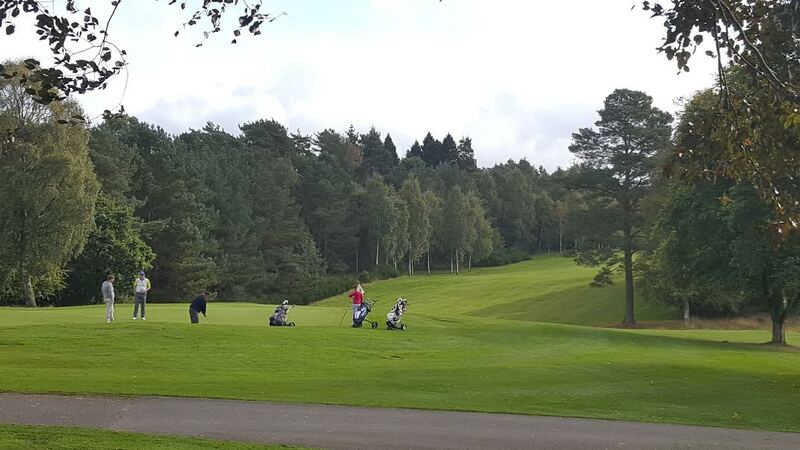 So we played 18 holes at Troon Darley before we set off home, what a great experience it was. Darley sits on the same large patch of land as two other South Ayrshire tracks, Fullarton and Lochgreen – just don’t be fooled into thinking that council run means a lack of quality. Not here it doesn’t and during the rest of our Scotland experience we were able to look around a few more of the South Ayrshire cluster, affordable golf that doesn’t disappoint in the slightest. I didn’t know it at the time but the Darley deluge of rain that struck us on 17 and 18 was the only time in the full 2016 Scotland adventure that I got wet on a golf course, another developing theme of the feature was that we were all destined to be incredibly lucky with the weather! 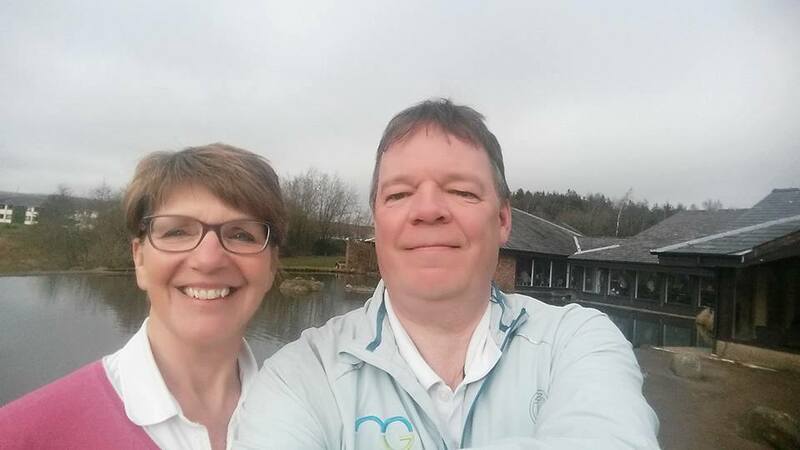 Following a drying off in the Troon Links temporary clubhouse (a brand new one opens this summer and looks amazing) we headed back home to Staffordshire and handed the travelling baton over to our favourite golfing couple. Our first trip to Scotland started with Newcastle upon Tyne for a visit down memory lane to my home town. 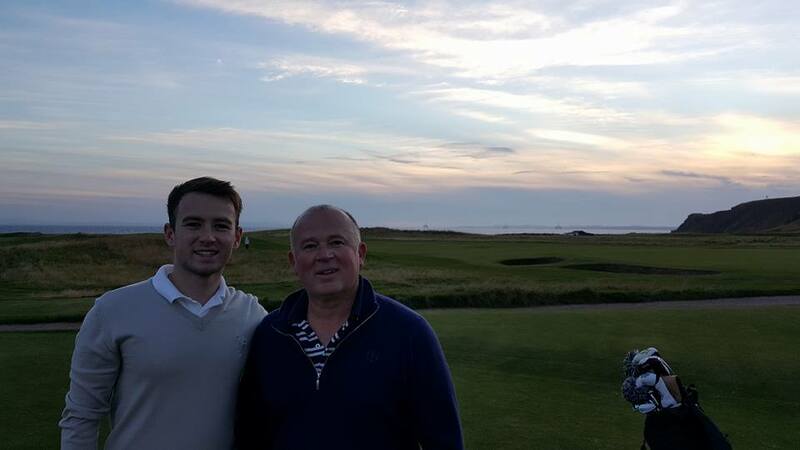 A couple of rounds of golf at Bamburgh Castle and Seahouses placed us en route to the Borders and organised meetings at the New Woll Estate at Selkirk, Peebles GC and The Roxburghe in Kelso. A theme arose that despite Scotland being the home of golf and receiving many visitors, proportionally few came from the Midlands. So we had a mission as well which was to discover why. 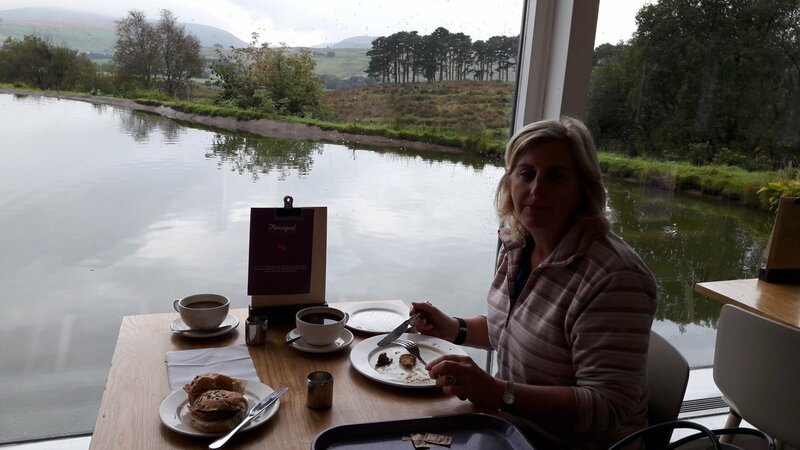 The Borders is perfect for that long weekend away, it took us just four hours from Stoke to Selkirk via Tebay Services of course for a bacon butty and a perfect view. New Woll Estate is family owned and we met Nicholas, the son with a story to tell, a revisit there in October with Carol to play the course was booked in the diary. 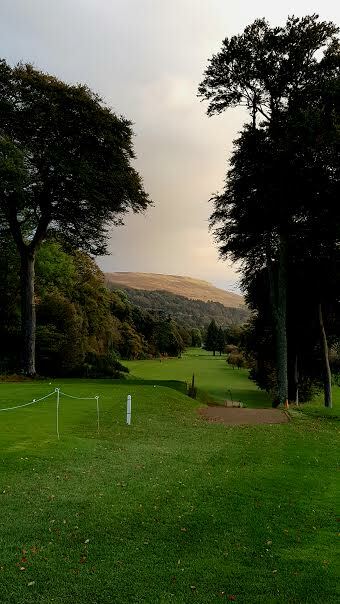 The historic town of Peebles is evident from their golf course and the exuberance and accommodating nature of Willy and Bill in the office confirmed the friendliness and open armed nature that would attract all golfers to the area. Then there was The Roxburghe in its glory but with not one inch of pretentiousness and the relaxed persona that comes as a result of the built in confidence of a venue steeped in success. An hour away from The Borders brought us to East Lothian, a mecca of links golf and courses that have seen many an international event where historically celebrities of golf have walked and played on the same course as we do. Golf allows us to do that. Our first trip was to Royal Musselburgh, a parkland course with its clubhouse originating in Norman times and the course itself being one of the oldest in the UK. It was another example for me of the sheer anticipation of what you would find. Initially slightly in awe I met the manager Dave, and the Pro Calum who soon put me at ease and sent us off onto a course which was a pleasure to play. 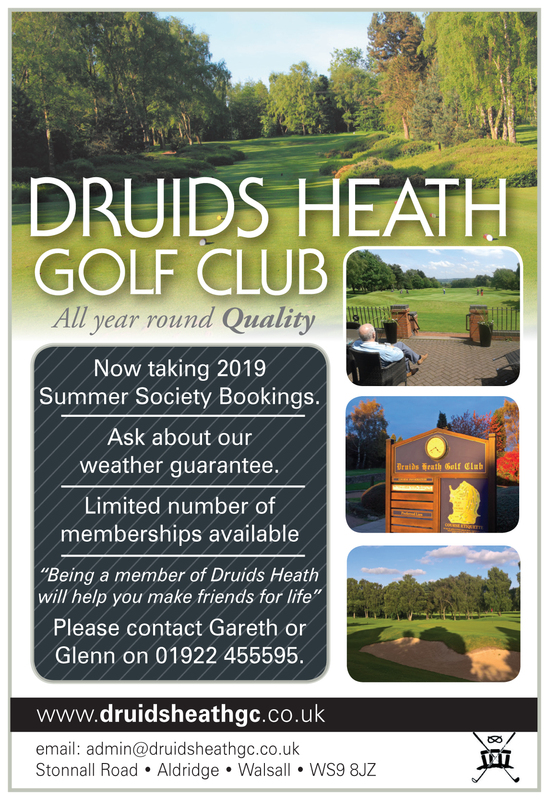 Further trips took us to Craigielaw, Archerfield, Gullane, Dunbar and Longniddry whose manager, Bob is linked to Golf East Lothian and the ‘cluster forum’ was established to embrace all the golf clubs and highlight individual courses that could accommodate all golfing budgets. Ladies only as trip number two saw Carol and I heading up to the Scottish Borders with the obligatory stop off at Tebay on the M6 for a cooked breakfast. By this time we were considering applying for our own MG parking spot! “Gee that’s a big horse” to which I replied “Carol, it’s an Aberdeen Angus” – Mental note, get your eyes tested!! Nicholas was a true charming gentleman and we enjoyed our day, also meeting the Captain of the Baberton Golf Club in Edinburgh who invited us to play there on our way back to Stoke on Trent. We headed straight to East Lothian and found our hotel for the next 2 nights, the Macdonald’s Marine hotel and enjoyed the sumptuousness of the room and the food. Truly spoilt to death and the langoustine was yummy. East Lothian this time had a trip to The Glen Golf Club with its distinctive cliff top landscape overlooking the Bass rock. Rumour has it that the staff lure some of its Transatlantic visitors with the yarn that the white top of the cliff is painted every few years as they pull the rock to land and normally run out of paint hence only the top is white. Incredibly some golfers believe this, in reality a huge population of Gannets nest there!!! 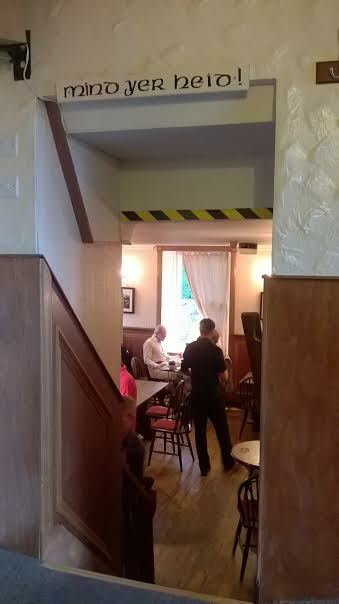 A trip led us to St Andrews and a meeting set up in a prestigious hotel, not Rusack’s I hasten to add. The extremely efficient marketing staff made us feel slightly amateurish, in retrospect probably should have done a bit more research before going there. Thank God for the fire alarm and Carol and I made a quick exit. We found some friends of mine who were playing at St Andrews and drowned our bad experience in gallons of wine. 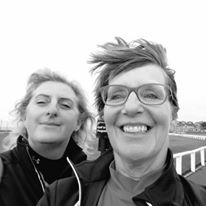 By this time when we nipped out onto the famous turf to take a selfie, it was getting quite blowy too! We went to two big hotels, the Green Hotel in Kinross with its own 2 golf courses and the Old Manor in Lundin Links, both ideal accommodation for Midlanders playing golf and visiting the sights around Fife which each hotel lying right on the main tourist trunk roads. 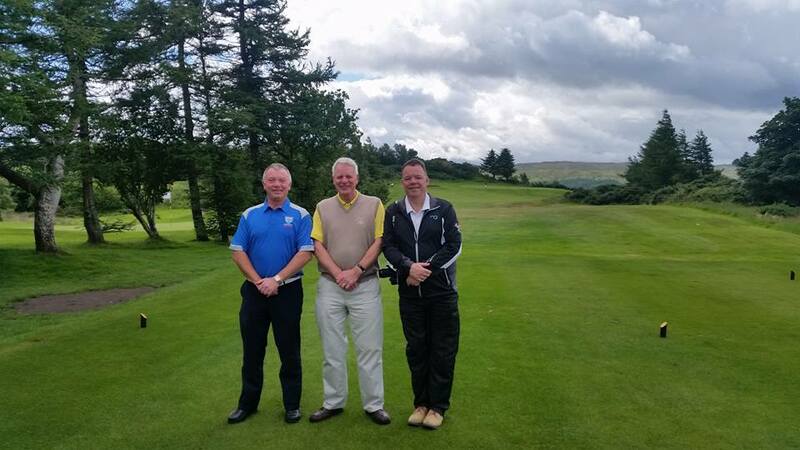 En route back to Staffordshire, we met the captain again from Baberton GC and played there. With views of the Forth Bridge and a capital city festooned with golf clubs hopefully they will come on board for our potential Scotland Supplement mark II. Just me this time, a solo trek where I didn’t get to play a whole lot of golf, but packed a lot into an increasingly crowded schedule, yet again the weather was mercifully very kind. It all began with Sunday afternoon trek to Earlsferry on the East Neuk of Fife, naturally via Tebay. My place for two nights was at St John’s House, situated along the same street as the house where a young James Braid was born and raised. 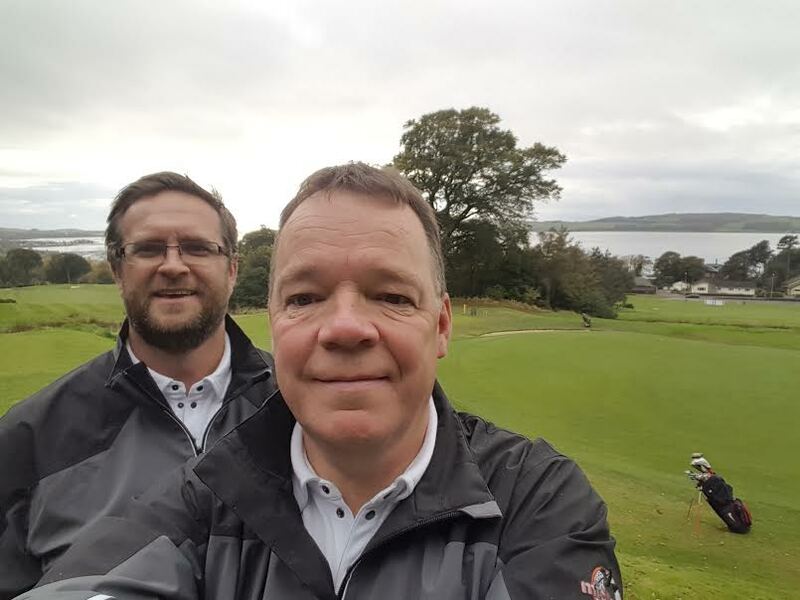 Our long standing friends Vincent and Greg Walker from Golfing Links who also live in the town own St Johns, a five bed luxury two floor town house that sleeps 10-12 golfers and is the ideal base for a Fife golfing trip. It was Ryder Cup Sunday and I had vowed to myself to drop my bags off and nip to the pre-recommended 19th hole pub a few yards down the road to watch the close. As that wasn’t shaping up too well, I stayed in and visited the pub the next night instead with Vince for a meal, very highly recommended. 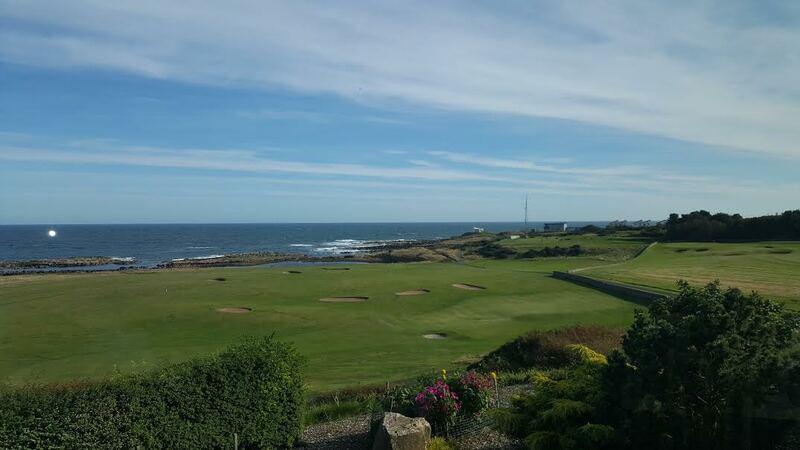 Monday was yet another sunny day and I packed in meetings at Leven Links, Scotscraig, St Andrews (twice) and Crail, you can imagine the golfing splendour on offer but I had a timetable to keep to. Back to Earlsferry for a late afternoon round at Elie Links with Vince and Greg (pictured), the golf course, naturally a James Braid design sits on open links land and it’s far extremities see right on edge of the Firth of Forth with the golfing coast of East Lothian on the other side in full view on a clear day, we had one of those. We could make out the ‘painted’ rock very clearly, a bit of a shame that low tides prevent ferry use from one side to the other, it’s quite amazing just how close to each other the two famous golfing regions are when you look across the water. But Monday afternoon was about a relaxing game of golf and what a round it was, with due respect to the others Elie was my favourite game in Scotland, might have had something to do with the fact that I played rather well, in fact all three of us did, birdies and pars were flying in, the memorable seaside stretch of three holes was conquered, level par by all of us. Ok it wasn’t as windy as it could have been, but we’ll take it and during the walk back to the clubhouse on the closing holes, we continued the form as the light faded. 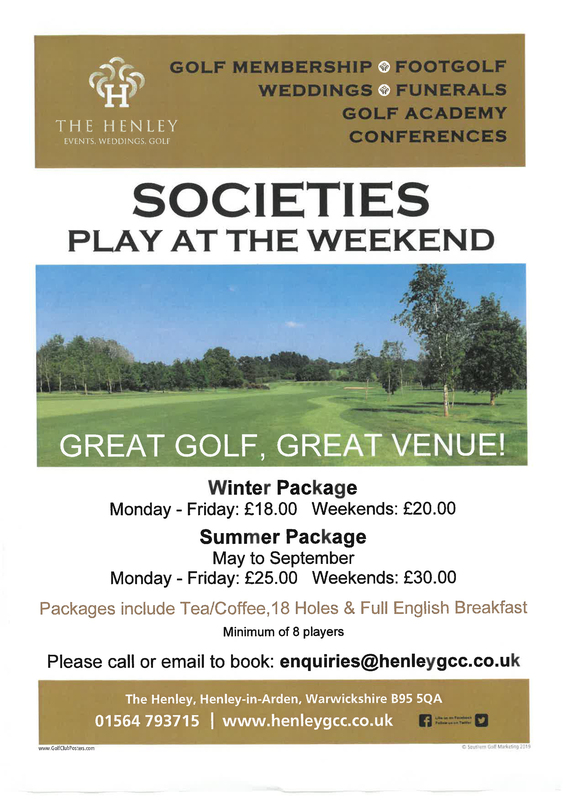 A lovely course and you must come and play it some day. It also has two quirks, firstly the periscope here. This is an unique way for the starter to check that the first blind from the tee fairway is clear before he waves golfers off on their rounds. And then there’s the 9th hole, a few years ago a young golfer performed a quite amazing feat here, one that has now been viewed by over three and a half million YouTubers worldwide. The video is here, the man who performed it, none other than my playing partner Greg Walker here. Greg is a very talented golfer but when we tried to re-create the feat from the same spot we all fell woefully short, the conditions just weren’t conducive to a repeat performance. So that was Monday and the following day offered no golf but it turned into an epic trek for which we ended up feeling truly grateful, as meetings turned into further meetings and our Scotland guide grew even further than we could have possibly imagined. Lundin Links and Ladybank in Fife then across the Tay Bridge to meet Jane Taylor from Carnoustie Country at Panmure GC. Jane was more than receptive and pointed my way further up the Angus coastline where her cluster of clubs reside. So later I visited Carnoustie itself, Montrose and then inland via Edzell, Strathmore and over to Blairgowrie. By now I’m getting my first glimpse of golf in Perthshire and what a gorgeous sight the 36 hole Blairgowrie is, those who know me in golf know that I’m very much a heathland/links man so when something parkland related catches my eye then it must be good. It’s on the bucket list and we thank Douglas from the club for his support. 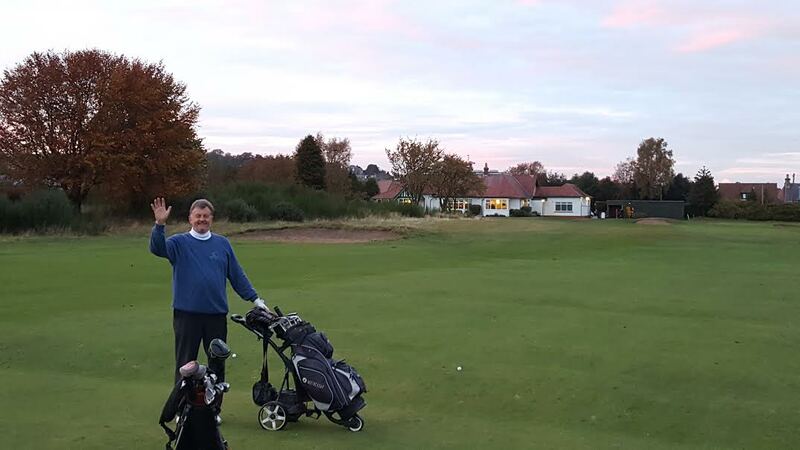 Those who know golf in Perthshire rate Blairgowrie as ‘the affordable Gleneagles’ , late afternoon I was delighted to just have enough daylight left to grab 20 minutes over at the real thing as I criss-crossed Scotland en route back to Ayrshire. 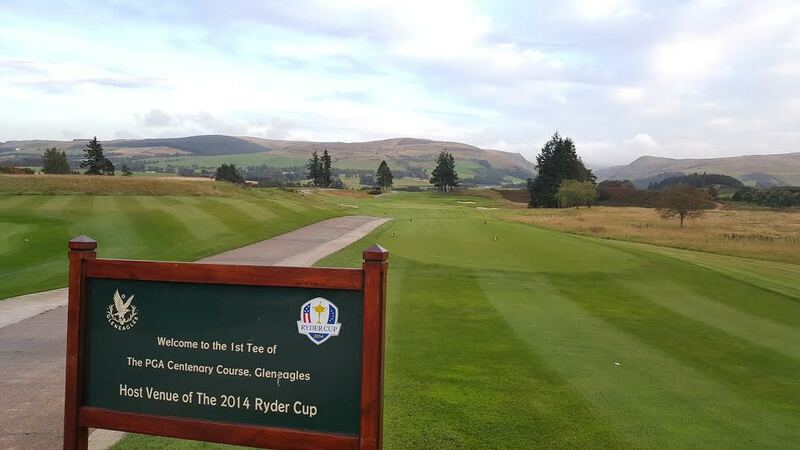 We missed out on featuring Gleneagles in this feature but rumour has it that 2017 we may well be back for a longer stay. Wednesday I was back on more familiar ground, Ayrshire beckoned again with more meetings to confirm their section in the feature. No golf again but I spent valuable time with the two Ayrshire reps we had befriended, Jamie who runs Ayrshire Golf in general, and I caught up with Keiran again from South Ayrshire. In the afternoon I visited another one of Keiran’s venues at Girvan and while there I grabbed a quick chat at Trump Turnberry too. 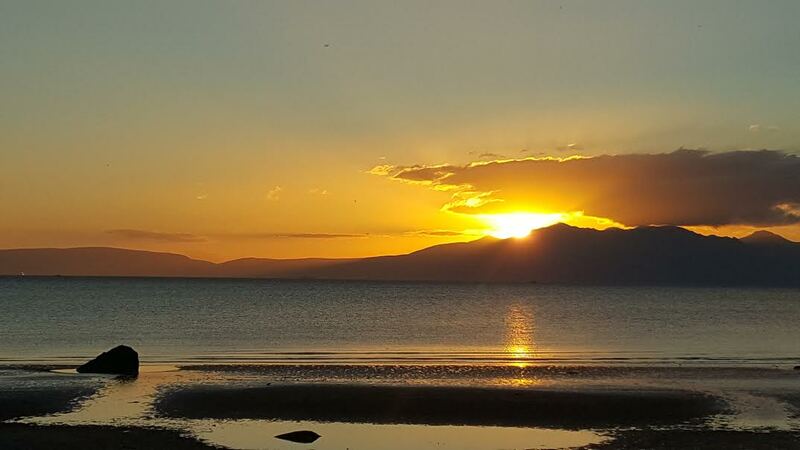 Stayed in Largs for the evening and caught this beautiful sunset over the Isle of Arran on my way up. I’d done enough at this point to guarantee more business and also one last epic trip to Scotland for more or less all of us. 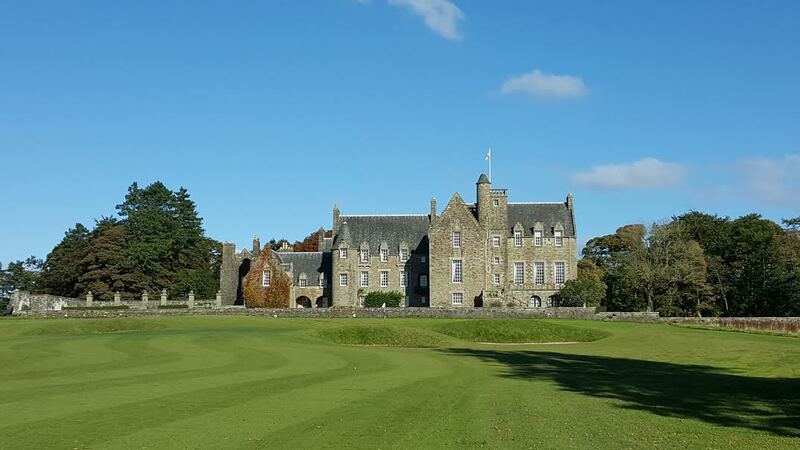 Thursday I could have headed back early following one last meeting at Rowallan Castle but David there who we had befriended earlier in the summer invited me to play a few holes and yep you’ve guessed it, it was marvellously sunny so I indulged. 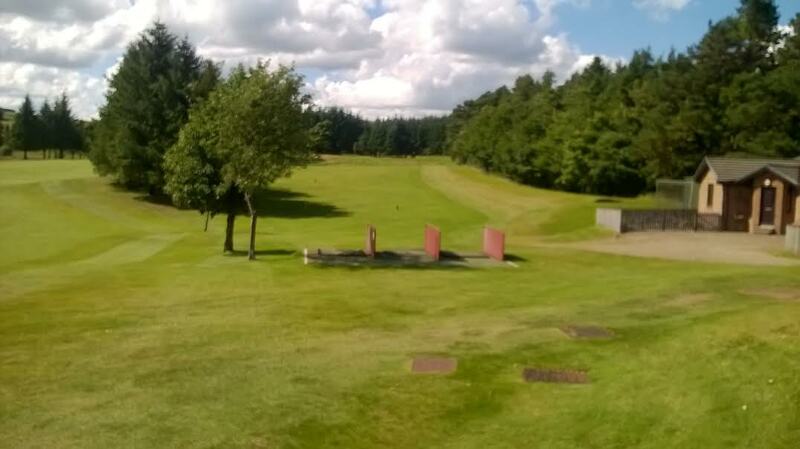 Rowallan is a new course, a Colin Montgomerie design set around the stunning 15th century castle. A well presented parkland layout with water hazards, large greens and one that becomes increasingly open the elements and lengthy too, the long hitters will love it. Clear days like I got offer great view of the Ayrshire coastline too. Finally I enjoyed a 20th hole snack before the long trip home, why is it the 20th hole? You’ll have to find out for yourselves when you visit, Rowallan has a quirky way of looking after their golfers who don’t have quite as much spare time as others. This is was it then, time to conclude everything and put all the bits together in one last final journey to The Home of Golf. 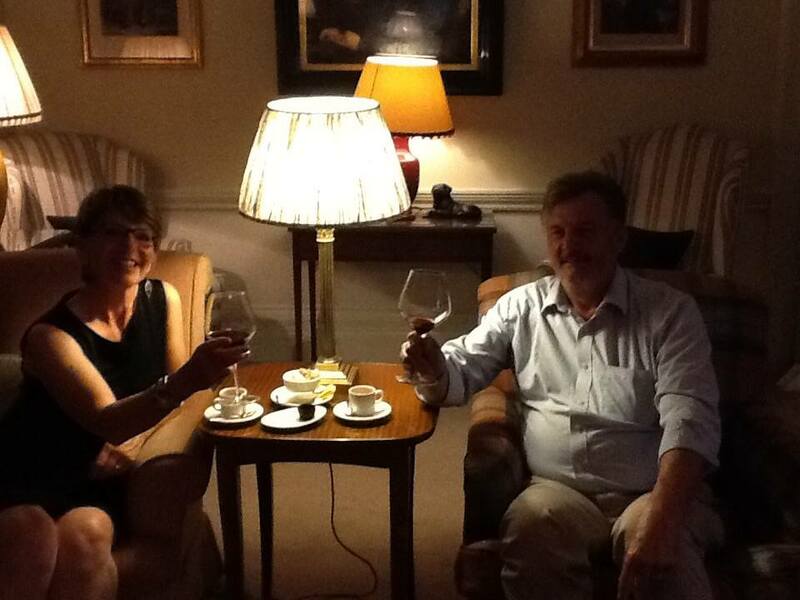 We had a bit on so divided up into two pairs to begin with, myself and Spencer for Ayrshire and Perthshire, Jean-Louis and Mandy (in her new second home) Borders and East Lothian. Hubby and wife took in a round at West Linton Golf Club in Borders on their way up to Fife, another James Braid design that offers some lovely views of the Edinburgh neighbouring hills and also plenty of nature too. Voted the friendliest club in The Borders, the welcoming nature extends all the way to the clubhouse and the food wasn’t half bad either. Mandy waved a tearful goodbye to her area and crossed the Forth Bridge in the evening to prepare for our Scotland finale. The day before, Spencer and I travelled up the other side to Ayrshire again, with all of the office banter still ringing in his ears as it had been all summer, Spencer was expecting much from his first Tebay breakfast which didn’t disappoint. After a couple of meetings we had one more Ayrshire course review to perform, one I had been looking forward to ever since the first trip in July. 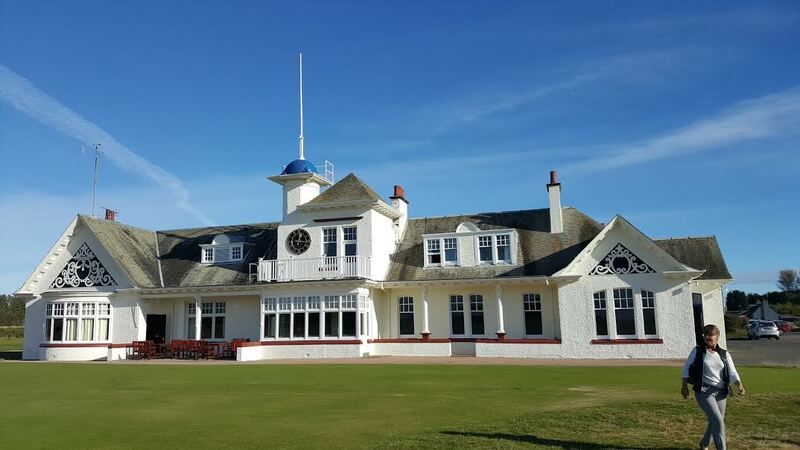 Largs Golf Club is known locally as Ayrshire’s Augusta, not just the region’s No1 parkland course but also a floral delight in the summer months too. In October we lacked that of course, but instead as the picture below shows we got ourselves a lovely early autumnal look instead. Another decent weather day and we thoroughly enjoyed this windy, testing and gently undulating course that has woodland on one side and sea views to the other. Look out for a real Amen Corner type stretch around the turn too, the fast rushing brook that winds it’s way across the course to the sea is quite a hazard to cross. Thanks to Andy in the pro shop and Debbie in the office for their help. We stayed at Brisbane House Hotel in Largs for the night but the next day was all about Perthshire. It almost seemed a little late in the feature to meet ‘Mr Perthshire Golf’ Allan Minto, but thanks to his work on our behalf and knowledge it turned out to be very worthwhile. Also we tripped over to Crieff Golf Club which was the furthest north we managed to get to during the whole thing, and also to Alyth GC. Spencer was left wondering why he hadn’t joined us earlier by the time I dropped him off at Edinburgh station in the evening, he ‘d got the bug – albeit a little too late. To The Old Manor Hotel then for the final fling, this was a relationship that Carol and Mandy had cultivated on their previous trip, and also met up with manager Morag too, one of THE characters of our whole journey. Mandy and Jean-Louis were already on their second bottle of red by the time I arrived, we dined in style and looked forward to Thursday. 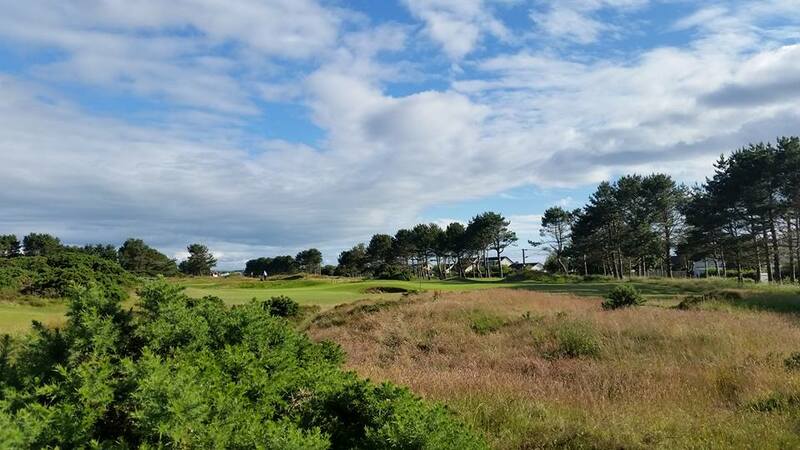 The next morning we nipped over the bridge again and visited two of the courses in our Championship Links Package, Monifieth Links and Panmure, classic links venues next door to Carnoustie, we really need to spend more time here next time. But we’d saved something special for the end, 36 holes of golf in Fife, starting on Thursday at Scotscraig GC. This was another relationship I’d grown through the year, Scotscraig are part of the Links With History cluster, four great clubs in Fife surrounding St Andrews. Alison from Scotscraig helped us enormously to get the feature together and when she invited us for a game so we could give her club some extra special attention, we weren’t going to turn it down. Jean-Louis was particularly proud that we were playing the world’s 13th oldest golf club and enjoyed himself immensely, although he did very nearly decapitate his wife, who was standing innocently on the ladies tee on one hole! I also got myself a prickly behind, but as you can view on the video, the shot played wasn’t half bad, it was painful believe me! 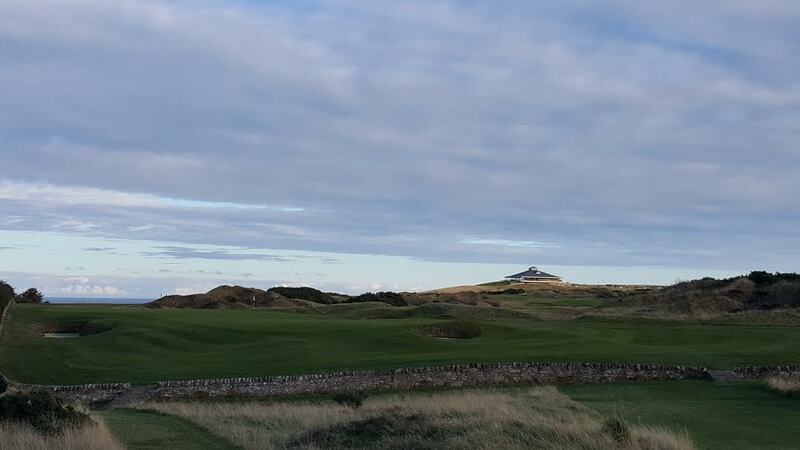 But Scotscraig was a true delight, if not that close to the seaside, it has all of the linksy golfing attributes you would expect to find, Mandy raised her game as dusk fell, squeezing a win on the 18th green in front of the clubhouse with a glorious sunset as a backdrop. A special round and as we opened another bottle of wine at The Old Manor on our last night in Scotland it was time to reminisce, ironically since the golf show, this last bit was the only time all summer and autumn that Mandy and I had been together in Scotland. We didn’t hit the bar too much on the last night we had a big day ahead, and we were lucky too that it was Morag’s night off, she had promised us something of a session had she been around, Mandy reckoned that it would have been a messy one had it occurred! One final day and we haven’t mentioned St Andrews too much but what a place to finish everything off as I’m sure you’ll agree. Fairmont later but we spent the morning there, more or less doing the touristy things, including THE photo of course (main image). But we were also treated to a tour of Macdonalds Rusacks Hotel which overlooks the 18th hole of the Old Course, where many top players stay when they are in town. 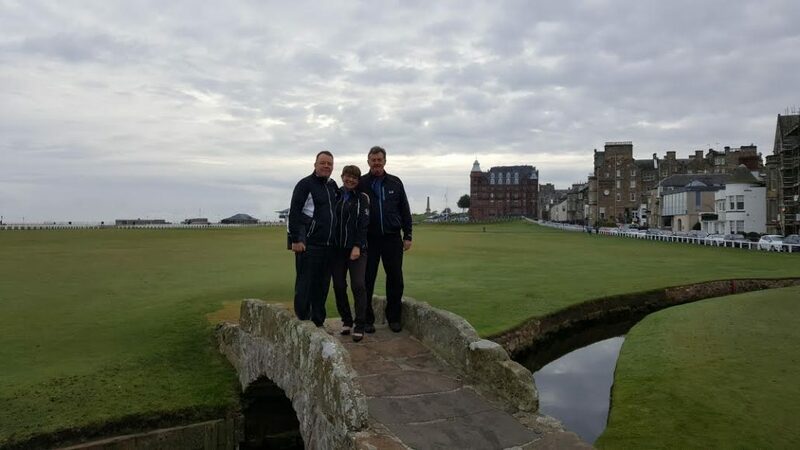 The final 18 holes were enjoyed by the three of us just up the road on The Torrance Course at Fairmont St Andrews. Set on slightly higher ground, the two courses here tread a path along a rocky coastline, very open land and we can imagine it can get a little breezy in these parts, but guess what? It was calm again for Midlands Golfer. Can’t say we made the most of the friendly conditions, the courses are long and you need to drive the ball well, not sure that we did. It’s new golfing ground at Fairmont, but they’ve set it up to be raw and traditional old links in style and it delivers too. The bunkering in particular is quite scary, tiny little steep faced traps that seem like you’re unlikely to find from distance, you tend to find anyway. But not to worry, it felt like ‘School’s Out’ time and we laughed and joked our way around, even playing up the wrong 18th hole. 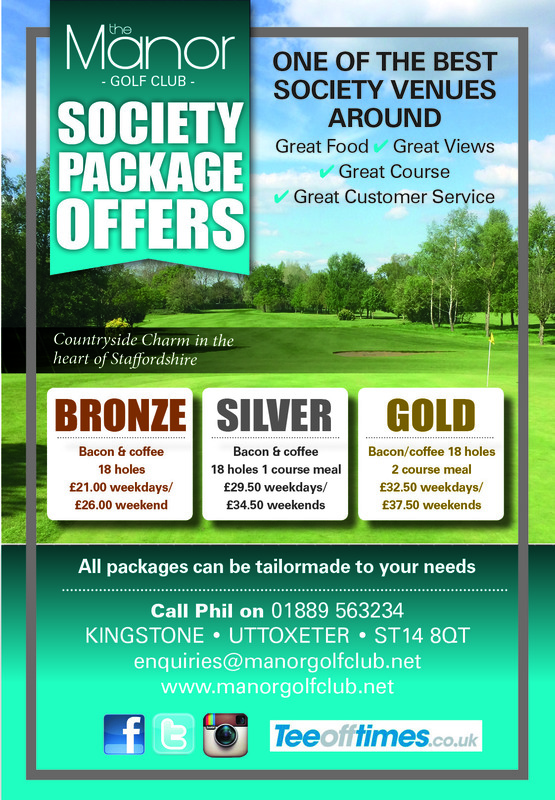 JL took the spoils and celebrated with a warming clubhouse coffee as Mandy and I took the buggy out to have a look at Fairmont’s second course The Kittocks. Equally as spectacular and challenging, there’s really very little to choose between them. A fitting ending and we parted company and disappeared off down south for the long trip back to Staffordshire. Despite taking different routes around Edinburgh, we managed to meet up one more time by chance at the No1 motorway service station on the southside. So what started at Tebay, ended there too. Midlands Golfer magazine would like to thank all in Scotland who have supported us and helped to make this feature a big success. We’d also like to single a few out too for special attention for their unstinting support, we hope this feature and magazine supplement is just the end of the beginning. We will return……….